• Heavy Cast Iron Base, with two levelling screws. Top surface is machined for smooth sliding of carriage having clamping screws for locking. • The horizontal scale fitted on the bed in machine divided on a Stainless Steel to a length of 0 to 20 cm in 0.5 mm division. Our organization is committed to deliver qualitative assortment and therefore, engaged in manufacturing optimum grade spectrum of Travelling Microscope. • The vertical square brass pillar is mounted on a traversing carriage that moves along the horizontal stainless steel scale and has a swingout magnifier for reading the vernier. 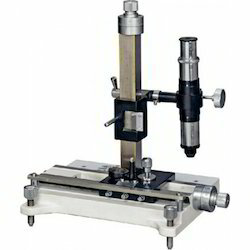 As a recognized name in the industry, we are offering an exclusive array of Traveling Microscope. We are a unique entity in this industry, actively committed towards offering a premium quality array of Travelling Microscope. Travelling Microscope :- Travelling microscope are specially designed to meet the requirements of Research Colleges, School and Industrial Laboratories. 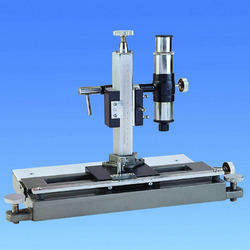 They are used for accurate measurements of the diameters of wool and nylon. They are also used in Physics Laboratory for more accurate determination of small.